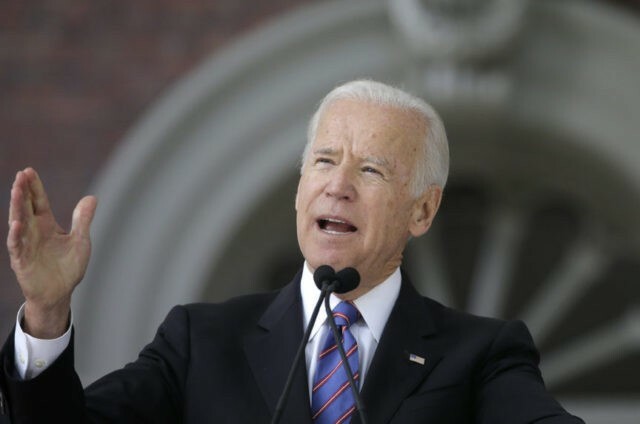 The Reuters/Ipsos exit poll found that 29 percent of voters supported a Biden nomination, putting him at top of the list of Democratic runners for the upcoming presidential election. Finishing second in the hypothetical field with 22 percent was Vermont Senator Bernie Sanders, an Independent whose 2016 candidacy was allegedly sabotaged by Democrats in favor of former First lady Hillary Clinton. Tying the rest of the poll were Senators Cory Booker of New Jersey, Elizabeth Warren of Massachusetts and Kamala Harris of California. On the Republican side, 65 percent of midterm voters said they would like to see Trump run for a second term in 2020. Another 11 percent said they would prefer a presidential push by Vice President Mike Pence and 12 percent said they did not know yet. Biden has been a strident critic of President Trump’s withdrawal from the Iran nuclear deal negotiated by the Obama administration. “Talk of a ‘better deal’ is an illusion. It took years of sanctions pressure, painstaking diplomacy, and the full support of the international community to achieve that goal. We have none of that in place today,” Biden said in May. He predicted pulling out of the nuclear deal would “put Iran back on the path to a nuclear weapon with no clear diplomatic way out,” as well as putting the United States on a “collision course” with its allies. Biden said as recently as last month that he had no plans to run in 2020, although he did not completely rule out the possibility. He said he would make a firm decision by January. If so, he would face mounting scrutiny of revelations into his business dealings since leaving the office of the vice presidency. This year, the book Secret Empires: How the American Political Class Hides Corruption and Enriches Family and Friends by Government Accountability Institute President and Breitbart News Senior Editor-at-Large Peter Schweizer revealed that Biden’s son Hunter secured a billion-dollar deal with the government-owned Bank of China through his own company during his father’s tenure. Neither Biden has answered questions regarding how that deal occurred or what the nature of such a negotiation with Beijing was.